I’m very honored! 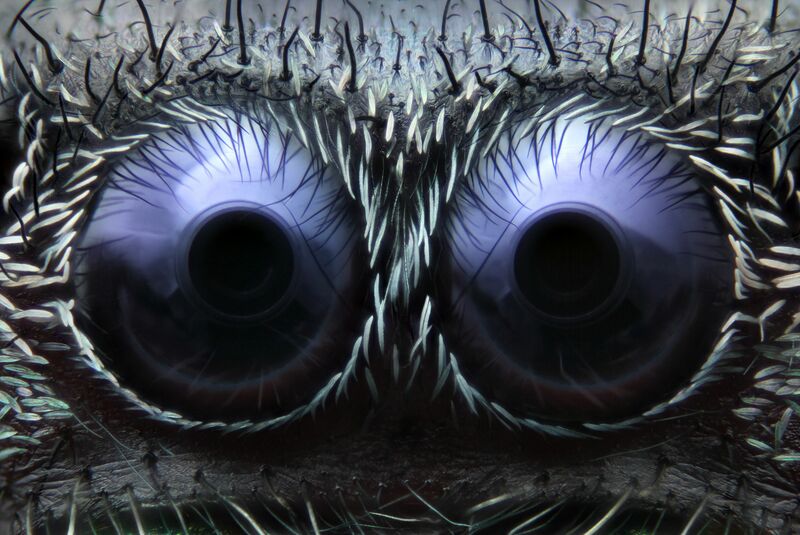 – My image of jumping spider eyes came in 3rd place in the annual Nikon Small World photomicrography competition. Below: Phidippus audax’s anterior median eyes from a head-on perspective. I’ve been waiting to enter the Nikon Small World photomicrography competition since age 15 when I first started doing photomicrography, as you have to be 18 to enter. This past year was the first that I was eligible to submit my work, so I’m very excited to have finally been able to participate in the competition. I used my photomicrography rig (written about below) to get this image. It took nearly 80 individual frames – focus stacked – to get the extended depth of field, each taken at 4 micron increments on the Y-axis. A few people have asked me where on earth I found this creature and they’re always very surprised when I tell them, “right in my suburban backyard in Connecticut.” It’s true – these beautiful creatures, full of vibrant colors and exquisite textures and patterns are right beneath our feet every day. Taking the time to look is a very rewarding experience for which, unfortunately, those of us up north will have to wait a few months. Insect eyes are one of my favorite subjects to photograph as the geometric arrays, particularly when it comes to compound eyes, are simply astounding. I also find insect vision to be a fascinating topic of study in general. If you’re interested, you can learn more about insect vision here.